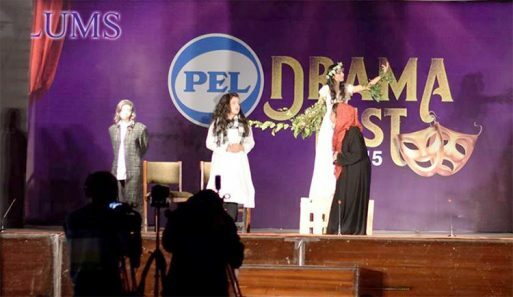 The LUMS DramaFest happens to be one of the most famous drama events for the students in Pakistan, where the drama fanatics from all over the country come under one roof, showcasing their talent. It is the event filled with entertainment, socialization and of course, theatrical acts. Given the image LUMS has across Pakistan and in South Asia continent, students have high expectations from the prolific institute. Seems that the DramaLine, the dramatics society of LUMS ignored various aspects of giving the students the event of the year and they feel disappointed. According to the Team Member of Aga Khan University’s Drama Team, the Management of DramaFest for Extremely Disappointing! This weekend LUMS stooped to new levels of unprofessionalism. The dramafest for us officially started on Saturday, because due to low visibility in Lahore our flights for Friday got delayed. Our team reached LUMS in the evening for registration. So AKU’s team can not comment on the quality and efficiency of the events on that day. From the very onset of registration, the LUMS Drama Festival 2017 was a muddled disaster. Till 2 weeks before departure, the date of Drama Festival was not even announced, resulting in late flights being booked and the final dates being set on Chelum. Still, teams dealt with flight delays and traveling without signals from Karachi to Lahore for the prestigious event. Unfortunately, that was just the first of the many ridiculous displays of ineptitude. Each social event began late, catering to the celebrity presence invited instead of the contestants waiting anxiously for several hours. For example, the Cabaret event was so poorly planned that after being asked to arrive at 11am, we officially began the event at 2 30pm. The celebrity chief guest was introduced as a judge, and after just 4 performances the judges began promoting their upcoming movie and entertaining the audience. After this, the “judges” left, leaving an empty auditorium and 11 more teams waiting to compete. This complete lack of regard for time or other peoples’ commitments seems to be the recurring theme for the DramaLine team this year. As individuals, we smiled and attempted to perform to the scarce audience remaining. The next day, we repeated the same cycle. After being asked to come to LUMS for a technical soundcheck at 3pm, and called multiple times to confirm that we will be there on time, our team arrived to an empty soundstage and our chaperone telling us that the stage isn’t even close to prepared. Naturally, when finally the stage was complete we were rushed through soundcheck, not getting nearly enough time to explain to the backstage crew how our set needed to be changed. Still, we grin and bear it because human error occurs and sometimes things get delayed. Giving the organizational team the benefit of the doubt once again, our team went to prepare ourselves for our performance which was scheduled at 8pm. Predictably at this point, our play was delayed. What was not predictable, however, was a call we received at 8 25pm saying “you are now performing second last. Come to the stage”. We rushed to the stage and before we even took a breath and got in position, our play was announced. Still, we push on, and everything was going smoothly until suddenly, just before our final scene, the curtains were closed on our actors. We can not ignore this. When asked for an explanation, we were told “ the band Kashmir is performing and we need to accommodate them.” Yes, our play was 3 minutes longer than the allocated 20 minutes. Yes, penalization was deserved for this fact. However, closing a participants curtain at the stroke of 20 minutes, is the height of disregard and callousness. It is apparent that the organizers have no idea how long and how hard participants train for this competition. How many sacrifices we make to attend the Drama Festival. It was very evident that this event had nothing to do with the plays after all. LUMS Dramaline was clearly more interested and invested in their celebrity presence. Enough so to completely humiliate the participants on stage. Enough so to refuse to let us go 3 minutes over time, after having us wait an hour for them earlier that day, at the risk of upsetting their celebrity band. Penalization was warranted, but the penalty is negative marking or announcements on a mike that the play has run over time, allowing the judges to take that into account. Those 3 minutes were the time it took somebody to introduce the band and hype up the audience. It was the time it takes for the stage to be cleared. For everybody there, it was an inconsequential 3 minutes. But for us, those 3 minutes were a years worth of practices. They were the conclusion to our play. They were our justification for dropping everything to come and perform at LUMS. Those 3 minutes were taken from us, as was our dignity. Nothing can be done about our play being incomplete, or the fact that we were frozen on-stage unable to comprehend how they were suddenly so stringent on time after a weekend of hour long delays. What can be done, is a correction of the attitude exhibited by the organizational team of Drama Festival 2017. Obviously, students with no experience should not be put in charge of an event of such magnitude. Clearly, they cannot handle the pressure and lack the maturity regarding how to treat their guests and their participants. They need to get their priorities in order. It seems upsetting how a university such as LUMS failed to meet the standard they set up every year. Guess the university now owes an apology to students and participants.